I have a habit of ticking off my husband with my oven usage. It’s not on purpose, it just tends to work out that way. The first time was when there was a huge summer storm approaching and we were expected to lose power for a few days. We had had some problems with our air conditioning not cooling the place down enough, but I was preoccupied with getting ready for the storm. I loaded up on all manner of convenience foods that I could cook in our gas oven or were ready-to-eat. Right before the storm hit, I made a big pan of baked spaghetti. This required me to use two burners and then the oven for 45 minutes. Almost as soon as I finished, the power went out. Naturally, so did the air conditioner. The temperature in our small apartment quickly soared in the Atlanta heat. As I dished out the spaghetti by candlelight (oh lawd, the additional heat!! ), I could feel a pair of eyes staring at me. I looked over at my husband, who was dripping with sweat and annoyance. “Didn’t I say it was a bad idea to fool with the oven when it was already hot in the apartment and the power was going to go out? !” Woops! On another occasion, he had a very early morning job interview. Naturally, it was very, very important that he get a proper night’s sleep. I thought it might be nice if I had a huge breakfast prepared when he got up, so he could start the day on the right foot. I decided to make bacon, egg, and cheese breakfast sandwiches with some sliced fruit and coffee. As I was quietly buzzing around the kitchen, I had the bright idea to cook bacon in the oven, to free up some stove-top space. Only, my baking tray was old and cheap (learn from my mistakes!). It quickly warped in the hot oven, bacon grease went splashing over the side, smoke came pouring out of the oven, and the smoke detector went off immediately. Beep, Beep, BEEEEEP! Beep, Beep, BEEEEEP! I was desperately waving a dish towel at the smoke detector when I could see a figure out of the corner of my eye, standing in the bedroom doorway in complete disbelief. Without a word, he turned off the smoke detector and returned to bed. I opened the oven door to take out the (now charred) bacon and the smoke detector immediately went off again. Ha! Thank goodness we are able to laugh about these things now! Naturally, when I told my husband about this recipe, his eyes nearly rolled out of his head. You’ll see why in a minute. It’s almost criminal to call this a recipe because it’s so simple. Just two ingredients and a screaming hot oven! This is the easiest way I’ve found so far to get really moist, juicy tenderloin. You can replace the jerk seasoning with anything that doesn’t have a high sugar content (the sugar will burn in such a hot oven), like low-sugar BBQ sauce or even a dry rub like Montreal Steak Seasoning. The key is to follow the baking instructions exactly. Preheat your oven to 500 degrees. That’s right, 500 degrees. Line a baking tray with foil and place your tenderloins on the tray. If you have a baking rack, place the pork on top of that. It will help the pork get an nice outside crust on the underside because it won’t be sitting in the cooking juices. If you don’t have a baking rack, just place your pork straight on top of on the foil. I’ve done it both ways, and it is delicious either way! Place a tablespoon of jerk seasoning on each tenderloin and rub all over. 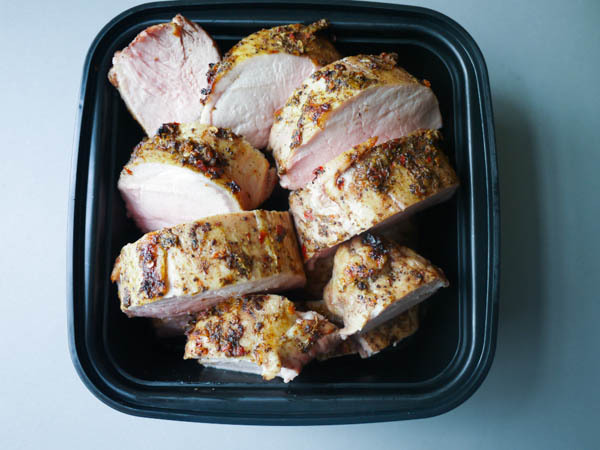 This jerk seasoning is incredibly spicy, so while it seems like a small amount to use on so much pork, a little goes a long way! Now, this is the part that requires extra careful attention. Make sure your oven has fully preheated to 500 degrees. It MUST be at 500 degrees. 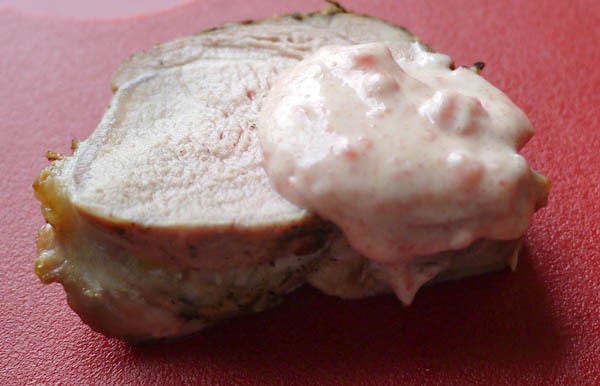 Place your pork in the oven and cook for exactly 6 minutes per pound. Because this tenderloin was 3 pounds, it roasted for 18 minutes. Look at the price label on the package to figure out how many pounds your tenderloin is. At the end of the proper cooking time (18 minutes in this case), turn your oven OFF. Let the tenderloin continue to cook in the residual oven heat for 45 minutes. Go for a jog. Or make a stove-top side dish. Or jump in the shower. Whatever you do, resist the temptation to open that oven door. The first time I made pork this way, I think I sat at the oven window for 30 of the 45 minutes looking at the pork and wondering how on earth this thing was going to properly cook in a turned off oven. I could picture the emergency room nurses laughing. 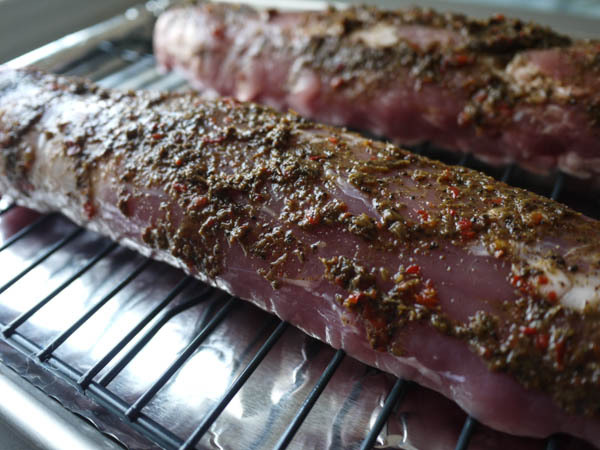 Another tip is to set a timer for the 45 minutes that the tenderloin is sitting in the oven. On a couple of occasions, I’ve gotten preoccupied with things and left the tenderloin in the oven for a few hours (yikes!). The longer you leave it in the oven, the more it will dry out. When your 45 minutes is up, take your tenderloin out of the oven, BUT DON’T SLICE IT! If you slice it up now, all the juicy goodness inside will run right out onto the cutting board. Leave the tenderloin to rest for at least 15 minutes, but preferably 30 minutes. If I make this while my husband is at home, he is hovering over it with a knife inside of 5 minutes and I have to keep him distracted. Do you SEE how juicy this is? Even with my terrible camera work?? 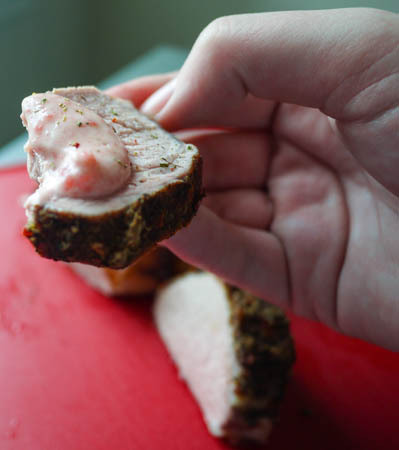 Dunk it in some Strawberry Ginger Mayo…. and take a huge bite! Forget about popcorn, this is the perfect snack for watching tv on a lazy Sunday. 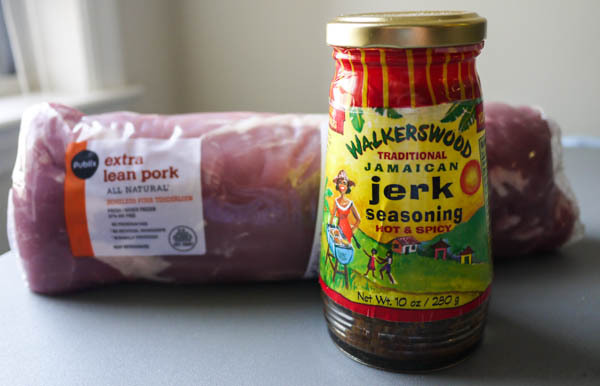 * Walkerswood Jerk seasoning consists of scallions, scotch bonnet peppers, salt, black pepper, all spice, nutmeg, citric acid, cane sugar, and thyme leaves. The small amount of citric acid is used to give it a hint of tart flavor. Most believe this is not a harmful ingredient. You can read more here at Livestrong’s Is Citric Acid Bad For You. If you would rather avoid citric acid or you can’t find Walkerswood Jerk Seasoning, Caribbean Pot’s Jerk Marinade Recipe is also super easy (throw everything in a blender! ), all natural, and very good. Tender, juicy jerk pork tenderloin roasted and then cooked with residual heat. Preheat oven to 500 degrees. That's right, 500 degrees. Line a baking sheet with foil and a baking rack (if you have one), and place the tenderloin on top. Roast the tenderloin for 6 minutes per pound. 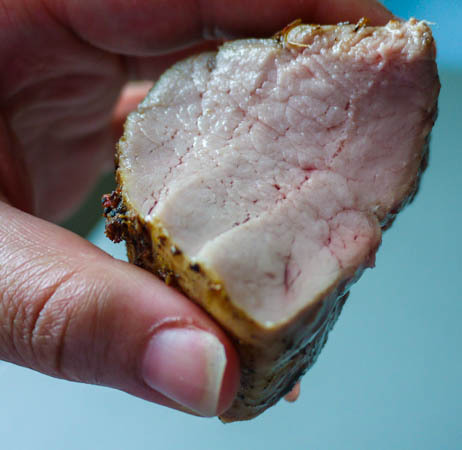 If you use a 3-lb tenderloin, that is 18 minutes total roasting time. Turn OFF the oven and let the tenderloin bake in the oven's residual heat for 45 minutes. DO NOT OPEN THE OVEN DURING THIS TIME. Remove tenderloin from oven and let rest for 15-30 minutes. 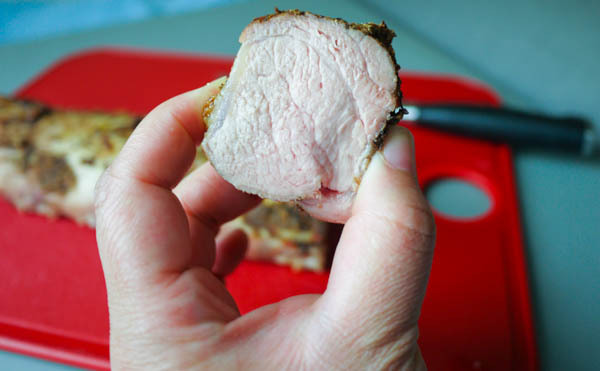 I love the oven usage story leading into the recipe followed with the step-by-step process to prepare the Pork. this tomorrow after Church for dinner. Thanks Tekesha! Love the recipe. I will have to try this recipe and tell you how it turned out. I love how simple this recipe is–I can’t wait to try it out, if I can find jerk seasoning in my small town! We made the Jerk Port Tenderloin this afternoon for dinner. Tekesha, your Dad and I were blown away with the tenderness, flavor, and delicious taste of this meat. We followed your instructions step by step and was totally amazed with the result. The recipe was so simple I had doubts and was anxious to taste it but we waited until the appointed time and WOW! it was worth the wait. Thank you my daughter for another excellent recipe. You’re the BEST!! We also made the Strawberry Ginger Mayonnaise. 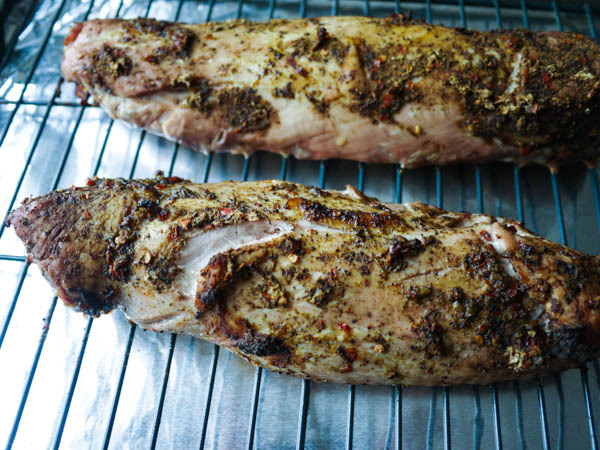 It compliments the Jerk Pork Tenderloin nicely. This was a beautiful combination. We are happy that we made both of them as you recommended. We highly recommend this dish!